Discussion in 'Requests for Proposals' started by jcv, Feb 23, 2016. We are happy to open up the next RFP. This is a smaller one than the previous two so if you want something smaller to get started on, this is a good one to try. All proposals must be submitted by 06:00 PM UTC March 8th, 2016. 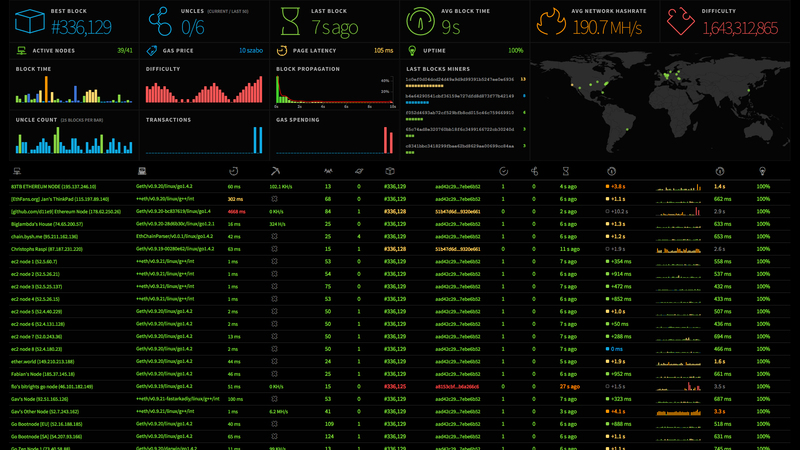 Ethereum Network Stats (eth-netstats) is a web dashboard for visualizing the status of the Ethereum blockchain and Decred currently lacks such a tool. This would give a heads-up display of the various goings on in the Decred blockchain, e.g. block number, average blocktime, average hashrate, graphs of several statistics. Familiarity with Node.js and some experience with HTML and CSS. Experience with references to prior work. This work will require replacing JSON RPC calls to the Ethereum daemon with calls to the Decred daemon. Any statistics that are not available from or not relevant for Decred need to be disabled in the web interface and backend, e.g. gas limit graph. There may exist RPC calls for Ethereum that do not exist in Decred, and in cases where it is not possible to port these calls, they may need to be disabled. 2 days FTE or greater (1 FTE = 40 hrs/week). Due to the limited scope of this RFP, there will not be any milestones. Payment in full will be made when the port is completed. Jim, michael sørensen, tacotime and 1 other person like this. I've already applied for Rfp0002, but this one seems to be so simple, that I will definitely try to contribute too. Thank you @jcv for the interesting RFP. Emilio Mann and tacotime like this. Not sure who made this, but it deserves some DCR in my opinion. koolykg and Reynold like this. Its made by @Dyrk and it has a donation address at bottom, so you can donate. 418Sec, koolykg, malimika and 1 other person like this. I feel this fulfills the RFP requirements. Hopefully he submitted one with the work nearly complete. ClokworkGremlin and bones like this. Thank you to everyone who submitted proposals. Both RFP-2 and RFP-3 received fewer proposals due to the specialised nature and specific requirements of Node.js experience. It is the project's pleasure to announce @Dyrk has been successful with both his proposals for these projects. Contracts will now be prepared and these projects will start as soon as @Dyrk is ready upon receiving them. As always, please do not feel discouraged from putting forward proposals for future RFPs, as the RFP process is continuous and iterative. Every round is a blank slate for you and your contributions are encouraged and valued. chappjc, Reynold, ZiggyZoomber and 4 others like this. Thank you to everyone who submitted proposals. Both RFP-2 and RFP-3 received fewer proposals due to the specialised nature and specific requirements of Node.js experience. Just between you, me, and everyone else who reads this, I think RFP-3 received fewer proposals because Dyrk had already completed most of it before the proposal was posted . Congratulations, @Dyrk, you earned it. Reynold, Lee Sharp and adam2312 like this. I think you are right. Hard to beat someone with a head start like that! Novel idea? The approved proposal is apparently now completed, right? (thanks @Dyrk). On the dcrstats page at the bottom there is stated that its a open source project. Would in not also be good idea to put in a clear statement that this was, for example, "Decred RFP-3 funded project" ? The success of self funding aspect of this project should be promoted! This is a bit similar to statements about funding with public (tax) money such as DoE contracts. Goal of this RFP is to port eth-netstats ( https://ethstats.net ) to work with Decred daemon. Dcrstats is database dependent, it uses many average values and other data which it's not possible to get from RPC calls (such as history of hashrate, difficulty, prices of course). That means that dcrstats need more time investments to maintain it, almost everyday something going wrong. For example: bittrex was down, btc-e was down, blockchain explorer was down, mempool size raised to 1000 transactions and average fee calculation took much longer than usually.. So I think that official dashboard with data available from RPC calls only is a good idea.